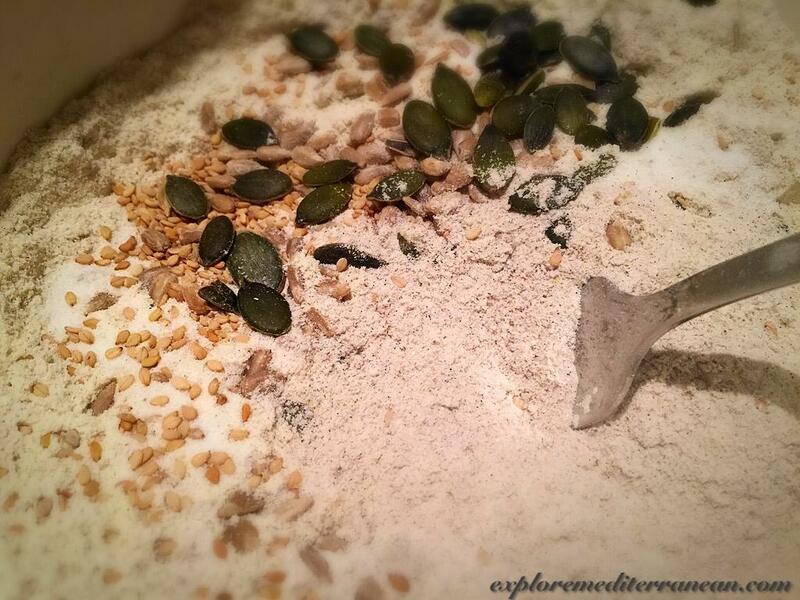 1In a large bowl combine flour, yeast, salt, seeds and mix with a fork. 2Add Olive oil, egg, warm water and mix well all the ingredients with a fork for a minute or two. 3Cut a length of parchment paper big enough to cover the loaf pan, spray it with a little oil and place it in the loaf pan. 4Put the mixture in the loaf pan and cover it with a plastic wrap or dish cloth and leave it to rise for 1h. 520 minutes before the dough is ready, heat the oven to 180ºC (350ºF). 6Place the loaf pan in the oven and bake for 20 minutes. This is a very easy recipe for making bread, you can also personalise it by adding other types of seeds or mix different types of flour to make it ever more tasteful. If you like it less soft, after baking it for 20 minutes, take the bread out of the loaf pan and bake it for another 10 minutes. The dough needs to be sticky when mixed (see the photo, adjust with water or flour to get the right consistency), you don't need to knead it, just put it right away from the bowl into the loaf pan.